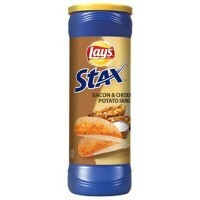 You've gotta try Frito Lay's Cheddar & Bacon Stax Potato Skin chips! These crispy thin chips are a real American treat that will take you back to fun times in the States. They come in a nifty 5.5oz container for on-the-go snacking. Go back to your favorite bar, your favorite team, and your favorite US appetizer with Cheddar & Bacon Stax. Dried potatoes, vegetable oils (sunflower, corn, and/or cottonseed), unmodified potato starch, rice flour, maltodextrin from corn, sugar, emulsifier E471, salt, dextrose, soy lecithin E322, acidity regulators E330-E270, cheddar cheese (milk, cheese cultures, salt, enzymes), whey, onion powder, flavor enhancer E621, whey protein concentrate, corn starch, natural flavor (including natural bacon flavor and natural smoke flavor), buttermilk, canola oil, romano cheese (part-skim cow's milk, cheese cultures, salt, enzymes), hydrolyzed corn protein, colors E102*-E110*-E129*-E133, skim milk, garlic powder, sour cream (cultured cream, skim milk), butter (cream, salt), blue cheese (milk, cheese cultures, salt, enzymes), bacon fat. *May have an adverse effect on activity and attention in children. Contains GMO. Nutrition facts (for 100g): calories 500Kcal, total fat 28.6g (saturated fat 8.9g), total carbohydrate 60.7g (sugar 3.6g), protein 7.1g, salt 1.6g. Il sapore è quello delle Pringles con una nota leggermente più speziata e poco più saporite. Si sente bene il formaggio. Mi piacciono. J'adore la boite ! Les chips sont super bonnes en plus !